Market owner Guido Porrati offering his focaccia in Rapallo. Italians never mention the words “locavore” or “farm to table.” They just do it — with immense regional pride. If a chef is in Tuscany, Tuscan olive oil goes into the dish, and hardly anything else from another region. As a pasta-maker in Liguria explained it recently, his ingredients travel “zero kilometers.” This time of year, that means artichokes, peas, fava beans, squash blossoms, strawberries, and more. Last month, on a tour of Tuscany and Liguria with a group of Boston Globe readers, we savored regional cooking in Pisa, Lucca, Cinque Terre, and in the other towns along the Italian Riviera. We watched the chef of Polpo Mario restaurant in Sestri Levante, on the Mediterranean Sea, make pesto from small-leaf basil grown nearby and Ligurian olive oil in a large mortar and pestle his grandmother used. Later, at dinner, he tossed the tiny twisted pasta called trofie with the bright green sauce. And because the restaurant is so close to the sea, and named for octopus, we were also served a plump tentacle, charred and draped over steamed potatoes. 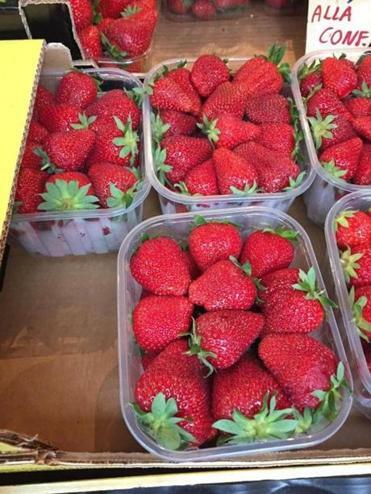 Strawberries for a post-lunch treat. In the cluster of five towns known as Cinque Terre, we dined well in Vernazza, which was nearly buried by mudslides in 2011 and is now entirely rebuilt. At Gianni Franzi restaurant, which looks brand-new (it’s a half-century old and owned by the present group since the 1960s), fish is the star. The chef prepared a seafood trio: cured white anchovies with lemon, split anchovies fried until golden and crisp, and squid and shrimp salad. Those ingredients appeared again and again. 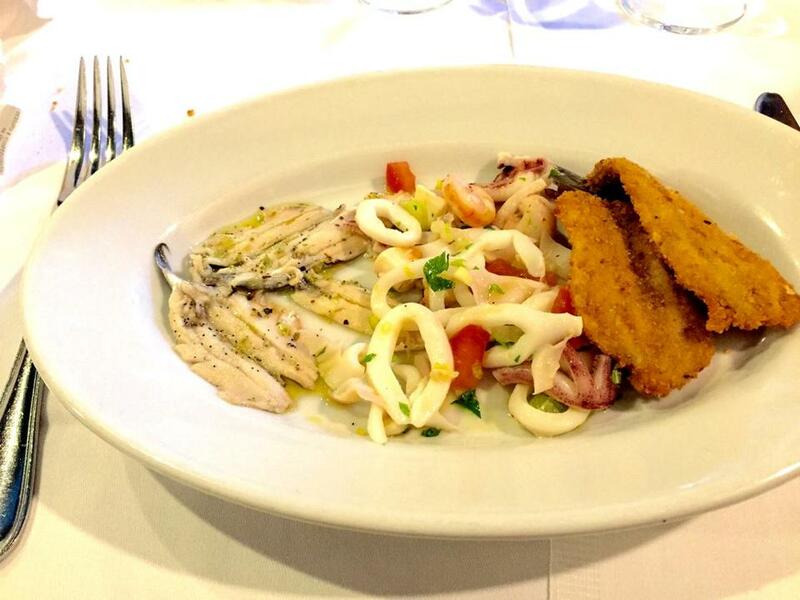 At Gabbiano Beach restaurant on Palmaria Island, across from Portovenere, tables are set waterside, and a menu might begin with classic fritto misto, here with squid and shrimp in a crunchy batter. Homemade limoncello, using lemons that grow on the property, is lovely after lunch, as are local strawberries with ice cream. 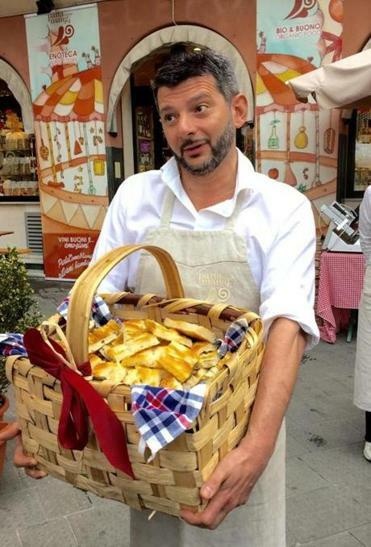 Guido Porrati, of the specialty market Parla Come Mangi, in Rapallo, greeted us with a big basket of focaccia and accompanied the group down the narrow streets to his favorite pasta shop, La Casana, owned by Gian Pietro Messina. Messina rolled pasta dough through a machine until he had a thin sheet long enough to cover his 5-foot work table, where he cut and filled all sorts of shapes with a mixture of local cow’s milk cheese and fresh herbs. Some dishes we imagined might have been around for centuries. In Lucca at Pizzeria Pellegrini, we tasted torta di ceci, a chickpea cake made with chickpea flour, water, and olive oil, which is pressed into a pizza pan, and baked in a wood-fired oven. That ancient Tuscan dish, once a mainstay of la cucina povera (peasant cooking), is now popular street food. Not nearly as old as torta di ceci is the cheese focaccia served at Manuelina restaurant in Recco, on the Ligurian Sea. Owner Gloria Carbone’s great-grandmother invented the dish 150 years ago and now focaccia col formaggio is the specialty of the region. To make the dish, a sheet of dough (flour, water, olive oil, salt, but no yeast) is rolled paper thin and draped over a pizza pan about a yard wide. Fresh white cheese is spooned onto the round in dollops, sprinkled with olive oil and salt, then another sheet of dough — this one even thinner than the first — is draped over the top. The golden, bubbly round took only a few minutes to bake in an ordinary pizza oven. We understood immediately why her grandmother’s dish — now called focaccia di Recco — became a regional specialty, and why people come from all over to sample it.